How Do I Remove PUPs, Foistware, Drive-bys, Toolbars, and Other Annoying Things I Never Wanted? - Ask Leo! How Do I Remove PUPs, Foistware, Drive-bys, Toolbars, and Other Annoying Things I Never Wanted? Casually installing one download may result in several other things being installed as well. I'll review the steps to remove these pesky, problematic, painful, Potentially Unwanted Programs, or PUPs. Ending up with random software on your machine that you never wanted in the first place is annoying as all heck. And unfortunately, it’s happening more and more. I’d say that PUPs (Potentially Unwanted Programs, although there’s rarely any “potentially” about it), rogue toolbars, and search-engine hijacks are some of the most common issues I see in my inbox. I’ll talk a little about prevention, but first, let’s walk through the steps I recommend when you suddenly realize you’ve been saddled with software you didn’t know you’d agreed to and certainly never wanted. A number of unexpected toolbars and other applications that show up on your machine are “relatively” well behaved. They are somewhat easy to uninstall using official mechanisms. What that means is that we start in Control Panel’s Programs and Features. Look for the item by name. Sometimes that can be tricky, as applications are intentionally named obscurely to make them more difficult to remove, but the well-behaved items we’re looking for here should be relatively clear. Look for names that include the word “toolbar”, in particular, as those are some of the browser-behavior-altering pests that often put us in this scenario. Right-click the item you want to uninstall and click Uninstall. We’ll do the next steps even if it appeared to work, because in many cases there will be traces left over, and sometimes those traces simply cause the PUP to be reinstalled. If you don’t have it already, download and install the free version of Malwarebytes Anti-Malware. If it comes up, don’t bother selecting the free trial of their premium product. While it’s good and potentially worth the investment, it’s not what you need right now. Stick with the free version. After you open the program, it automatically updates its database. Click Scan Now to perform a scan. The Malwarebytes scan may take a while. When it’s complete, you’ll get a notification if you have malware or PUPs. Even if no actual malware is detected, potentially unwanted programs – PUPs – may still be found. Malwarebytes will show you the entire list. You can review the list if you like, but in general, the correct next step is to simply quarantine everything. You will likely need to reboot. A clean scan is your goal. It’s possible that Malwarebytes is unable to remove some PUPs. If that’s the case (or even if it’s not), I still want you to take one more step. 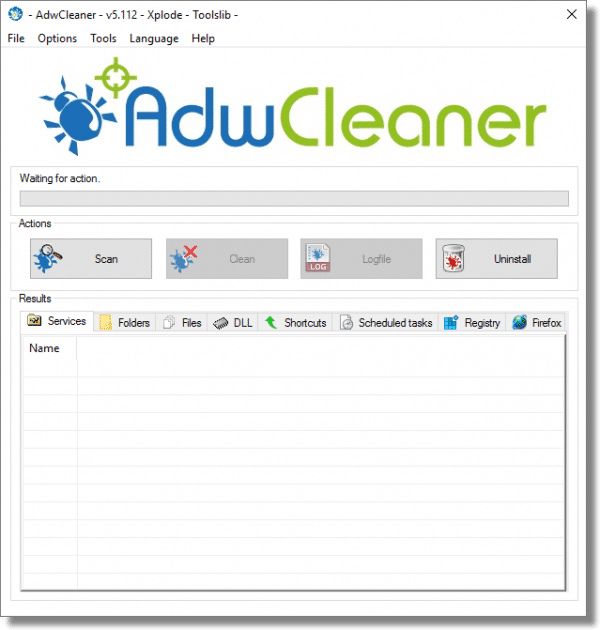 AdwCleaner is perhaps best downloaded from our friends over at BleepingComputer.com. It’s actually from France, and if you’re not careful, you can easily end up on their French language website (or at least I did). That’s not a big deal if you speak French, I suppose, but I don’t, and I’m guessing many of you do not as well. AdwCleaner has no install. Once downloaded, simply run it, and answer Yes to any UAC prompt. Click each of the tabs in the results box at the bottom of the AdwCleaner window. This will list each item it has found which it thinks is a candidate for removal. Here you can see that AdwCleaner found several folder it thinks should be deleted. If you’re not certain you need it, leave it checked. In other words, go ahead and let AdwCleaner clean up anything you don’t recognize by clicking Clean. It first warns you that all programs should be closed. It will close many programs, including some that normally start automatically when you log in. AdwCleaner will likely require a reboot when it’s done anyway, so those programs will return then. AdwCleaner scans, cleans, and presents information on preventing this type of thing from happening in the future, similar to what I’ll discuss below. You’ll then get a Reboot Required message. Click OK, and your machine reboots. After the reboot, AdwCleaner shows you a text file containing the results log of its operation in Notepad. You can just close Notepad at this point. Now, even with the tools I’ve outlined, and other tools that may also be used or may come along later, there’s a real possibility that the unwanted software will still not be completely or successfully removed. This often happens when the PUP is new and the security-software makers are still catching up to the latest tricks it might be playing. So, I have to include this to be complete. It’s worthwhile to consider restoring to a recent backup image. Restoring will make these things go away every single time. If you have a back-up image of the machine as it was prior to these pests having been installed, you can simply restore your machine to that image, and they’re gone. No fancy tools are needed, and you needn’t just hope that it’ll work. Restoring to a prior backup works every time. Presuming, of course, you have one. PUPs and related pests arrive in several different ways, but the most common method is by being “offered” to you when you install something else. Often, the offer is hidden and defaulted to Yes. The technicality is that by choosing this default (or not unchecking the appropriate box) when you install some program you’ve downloaded, you’re actually asking for this other software, these PUPs, to be installed. Whenever you install any software – even software you’ve purchased – always choose the “Custom” or “Detailed” option. Choose whatever option is not the default option. Then pay very close attention to every option you’re presented. If it’s offering you something that is not clearly related to the software you want, uncheck it. If it’s offering to change your search page, uncheck it. If it’s offering to install some toolbar, uncheck it. The bottom line is that if you’re not careful when you install software – even software from reputable vendors – you may end up with things you never expected or wanted. There’s nothing “potentially” about it. An Easy-to-Miss Source of PUPs - PUPs, or Potentially Unwanted Programs, appear when least expected. Should I Accept My Security Software’s Recommendation of What to Remove? - Should you trust your security software to make the right recommendations? Typically, yes, as long as you're using reputable software. Why Did I Get this Additional Driver Utility? - More frequently, unwanted software is included in the download package of things you actually want. 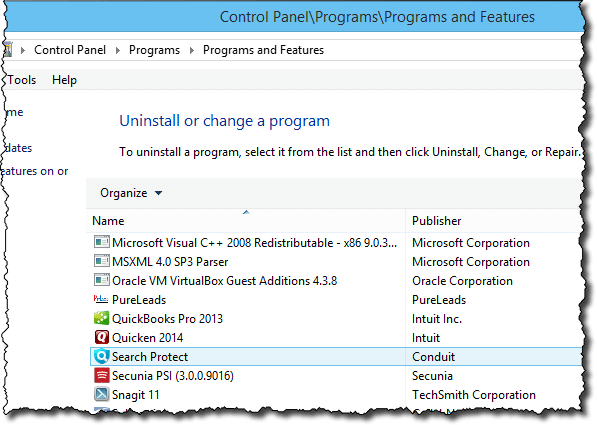 Preventing these programs from being installed is easy; getting rid of them may not be. How do I keep my browser from being hijacked? - Be careful where you download things, and know exactly what you're downloading. Potentially Unwanted Programs (PUPs) are becoming common. For example purposes, I installed ImgBurn – a utility that I actually recommend for CD/DVD burning and ISO manipulation – with default options. Several PUPs were installed as a result. I can’t underscore enough the importance of never, ever choosing a default install any more, and always paying attention to all options. « Previous post: Ad Free Outlook.com – With Support? I had some PUPs that showed up in Malwarebytes. They were all registry entries. I had Malwarebytes remove them, but they always came back. This is what prompted me to try a few other solutions. When I ran Adwcleaner, it found a few .exe files scattered around in different folders which it removed. After that, the PUP never came back. So even if an antimalware program tells you it removed the problem, It might not have removed all of the problem, and running a few different antimalware programs might be necessary. Restoring from my backup would have been a lot of work as I wasn’t sure how far back this PUP had been on my machine, so I wouldn’t know which backup I would have had to restore from. I’m a firm believer in Revo Uninstaller. It seems to do a decent job in removing unwanted BS. But not always. So, against advice from people that know more than I do, I open Regedit and hunt down anything that looks like it has anything to do with my headache, delete the bastoid and anything to do with it and reboot. There’s multiple places where the insidious sucker install a register entry – delete all – reboot. Oh yeah, save your registry somewhere on an external (thumb) drive JIC. Editing the registry can be dangerous unless you know what you’re doing, but if you understand what you are doing, it’s usually ok. A backup is the key, unless the change is one which won’t even let you boot up. A couple of other things to watch out for. Sometimes the PUP authors will put in a screen with the box checked which uses confusing language which can lead you to believe that it is an important component of the program you are installing and will put in something like (Recommended) to fool you into thinking it’s necessary or useful. Also, if you have Java installed (generally unrecommended), Oracle tries to install this kind of malware on your system every time it updates. So be very careful when installing Java updates. The Adobe Flash player is particularly tricky, because you make the choice of whether to include the PUP before actually downloading the installer. It’s a check box on the download web page. Since this is uncommon, even seasoned “custom installers” can get bit by it. I have downloaded the PUP version a couple of times. Luckily you still can stop the install once you realize you don’t have the choice to exclude the PUP installation, and go get the correct version. But it’s very tricky and sometimes alarming to see that “McAfee scanner is going to be installed” without the option to say no. I’ve been using MalwareBytes for some time now and have a lot of confidence in it so was intrigued when you mentioned AdwCleaner. I downloaded and ran it on my XP machine (yes, I know) and reviewed what it found and didn’t see anything that seemed to be interesting. Ran the cleanup and rebooted then got this error: Bootmgr is missing. Restarts a few times same problem. Luckily I had a Macrium recovery CD and was able to repair the bootup but I’m concerned that this product could have deleted something that rendered the machine unbootable. 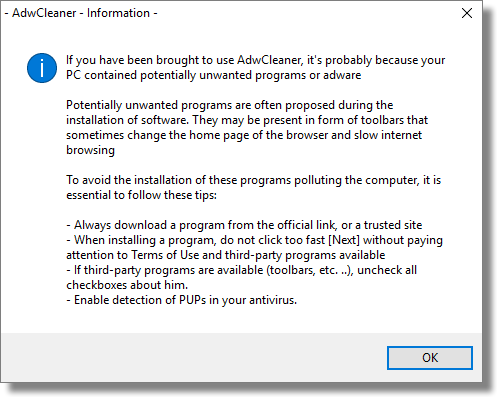 One thing about AdwCleaner is that it works in a way similar to antimalware programs and therefore relies on antiadware definitions. AdwClenaer will not run if it is 10 days old: it will link you to it’s homepage. Bleeping Computer must keep up as well. I was unchecking boxes before I was old enough to grasp the concept of advertising: I declined things in a very mild “No Thank you” kind of attitude without questioning why the products was offered. For years I took unchecking completely for granted, but recently I found out that people fly through installations without thinking. I like their number one unwanted behavior, “Lack of Choice.” That takes it right out of “potentially” unwanted and straight into unwanted! Advertising: The software delivers out-of-context advertising that interferes with the quality of your computing experience, regardless of whether you consented to this behavior or not. Advertisements: The advertisement should not mislead you into visiting another site or downloading files. All of these examples could be used to describe the GWX campaign MS is running on everyone’s PC. My thought exactly, Brian McD! I use both Malwarebytes, and Revo Uninstaller. Revo will find all of the registry entries and remove them for you. When using MWB and finding that the problem is not solved when you reboot means that you have to restart in ” safe mode Without networking ” and run the program again. This almost always works. Leo, I have never thanked you for the many wonderful articles that you provide to help us be more informed users. Today, I just couldn’t help myself from responding to your fun alliteration (Pesky / Problematic / Painful / Potentially Unwanted Programs or PUPs). You make what could be dry, unappealing information into stuff I want to read – aw, shucks – couldn’t do an alliteration myself :(. Anyway, thanks again and again! System Restore is great when it works, but it has so many problems, that it’s not good to rely on it as a solution. Even if it works, it won’t necessarily remove every kind of foistware. Another terrific article Leo, thank you. I will definitely be saving this one. Thanks Leo for the update. I’m currently using MSW 8.1 non-touch on my new computer. I use Malwarebytes because for some reason manufacturers are bundling in quite a lot of ridiculous programs on new computers right out of the box. It took me a few days to set up using Defender, CCleaner, and Malwarebytes. I also used Microsoft’s forums to figure out how to fix the display. After reading the update on this page, I tried downloading AdwCleaner, but my computer stopped the installation. Should I turn off real-time protection and install anyways? Or should I simply rely on the software I’m using sans AdwCleaner? 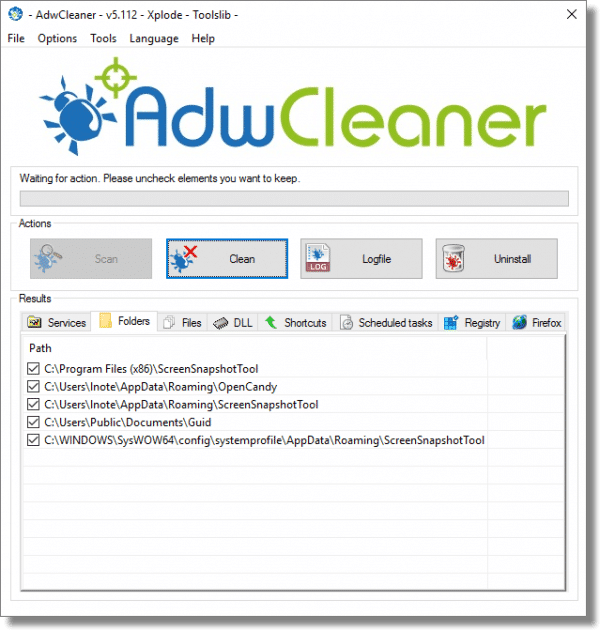 AdwCleaner is a standalone program that doesn’t have to be installed. Just run it and it should work. If it doesn’t I’d download it again and see if it runs. There should be no need to disable your real-time protection unless for some reason your AV complains about AdwCleaner. I had to turn off my virus scanner to let Adwcleaner run. If it wasn’t for my longstanding trust for Leo’s advice, I would have hesitated. It actually found a few minor things, but it also deleted my OpenDNS software. So it isn’t totally foolproof either. Restoring from backup is the best solution; if not the only solution, certainly the safest. But it may not be easy to get your data back to where you want it. Step one in any restore is to take a new backup of all your data, and preferably a full image backup, in case you don’t know exactly where all your data resides. Then restore the whole system from an older backup, then restore your data from the immediate backup. Depending on what applications you’re using, if you don’t know exactly what you’re doing you could really make a mess of things. Outlook or Live Mail alone can be nightmares. Proceed with care, take precise notes, test everything, and be prepared to start over. I also use hitman pro and scan my computer. You can get a one time usage. There is one for system 32 and 64. I also download Web of Trust and put that in each browser. Try Norman Malware cleaner. You need to download a new version each time you use it, because it has the signature files in the program. It is meant to be used from a flash drive but you can copy it to your hard drive. It work much like Malwarebytes, but in some cases it can clean out malware that malwarebytes can’t. It does take some time to download the first time, but if you update from the installed program folder it updates faster the next time. This kind of thing is so prevalent anymore that I take the sandbox approach. I use Toolwiz which is a good freeware program that has several good tools and features, but the best is their Timefreeze. Start it before installing anything at all questionable, if the results from the install are not what you expected or wanted, just roll it back to before you did the install. If the install was OK you can turn off the timefreeze and continue. As with everything else this is not a perfect solution but seems to be the best approach for me. Leo, I commend you for your information on PUPS and Malware, it has been most enlightening. I have been assisting retired folks computers for some years now and your recommendations are most helpful in assisting me in maintaining their PC’s, mine included. Thank you for this article. I thought I had cleaned my PC of this stuff but your suggested program found more of it!!!! May I suggest a free software app which runs in the background called “Unchecky” it unchecks all those unwanted bits before you instal. If you try to instal anything with checks in it it will warn you. I never heard about Unchecky till I read your comment. I Googled it and one of the results was CNET. I wonder if CNET bundles it with malware :-). One thing I have learned over the years, is that CNET ( or it’s derivative Downloads . com ) are not to be trusted at all. Almost everything at DL.C is infested with malware. Do the extra work, and find the original sites for any free programs that you think you might need. Spot on…lots of questionable stuff on CNET. I try to use the software publisher’s site. I’ve written on this before: Is it safe to download from download sites? Did the above and adw cleaner wiped out an important program packed with needed data and now google chrome won’t open. More fool me I guess. I love ninite.com for installing and updating program like Java. No toolbars, no clicking next, just installs. I use the pro version to push out these updates at work. Leo, one commentator stated, “Ran the cleanup and rebooted then got this error: Bootmgr is missing.” I don’t think that AdwCleaner actually caused this problem. Do you think so? Also I have read many reviews on AdwCleaner and the only consistent negative item that many people have stated is that it wipes out the settings for the Chrome browser. I don’t use Chrome. Firefox is my default browser so I am not concerned with that one negative aspect of AdwCleaner but I would be concerned if it deleted my Bootmgr. I don’t have enough experience yet with AdwCleaner to rule it out, but I agree – it seems unlikely. But of course I don’t have another explanation since we don’t know the entire story of what’s been done to the machine or it’s overall state of health. THANK YOU. I was having an issue with unwanted pop-ups and hyperlinks and found out it was PureLeads causing the problem. I was able to uninstall it with the control panel, as you did. Thank you for the great information on PUPS and other malware. My computer was clean but my wife downloads games and recipes with the result that it sometimes took 30 minutes to get online because of the ad-ware. Once installed the two free programmes you recommended did a fantastic job. My wife is happy to have a useable computer again. I always look forward to receiving your newsletter. Thank you again. Thank you very much for advising on how to remove the “Your file down loader” . It was successful. MalwareBytes ALSO misses alot that MSE misses…most of the time when I run either, nothing shows up be it a virus, PUP etc…where other programs that are well known and Ask Leo has recommended DO find and I am able to remove. The AdwCleaner can remove things that you don’t want removed and there isn’t a choice beforehand. AdwCleaner removed a folder from my Favourites folder that I had put together for finding things like reverse addresses, telephone numbers etc. I think I made the mistake of calling it “Search” and it was a subfolder of the Favorites Bar. Other than that it seems to have done no other harm and removed a couple of things that mbam missed. You mention CCleaner somewhere. I use it regularly, but only the upmost (“wipe”) option. I have been a little hesitant to use the “register” option. Can you recommend that I accept all the corrections to the register which CCleaner suggests, without having to be afraid that problems result (never got problems with the “wipe” option) ? A better option would be to research items detected by AdwCleaner prior to deletion to make sure that they are indeed things that should be deleted. And, of course, to create a backup prior to running it. I agree with you Ray. I’m no techie and I have no idea what these folders and registry entries mean. Leo cautions about registry cleaners, but then says to go ahead and let AdwCleaner do its thing. What?!! AdwCleaner found so many registry entries I was afraid to let it clean anything. So I’m back to square one. My question is this: How does a “regular guy” not a “computer whiz” know which folders/files/entries are important and which are not? I’m not ready to gamble and find out my computer won’t work after running AdwCleaner. Due to my ignorance I always err on the side of caution, hence I’m sure my computer is loaded with PUPs. In your shoes, I’d back up the data, restore the system using the recovery partition, reinstall the software and then restore the data from the backup. This is the #1 best option. The #2 best option is to create an image backup – using the utility that comes with Windows or an app like Macrium Reflect – and, once you’ve done this, let AdwCleaner do its thing. If it doesn’t work out well – and likely will work out well – you can use the backup to get your computer back to the exactly how it was prior to running AdwCleaner. That said, you really need to think about how this stuff is finding its way onto your PC and stop it from happening. The vast majority of malware infections – more than 99% – happen due to 1) carelessness with email attachments; 2) the operating system or apps not being kept up to date; or 3) being installed side-by-side along with some other application. If you take action to address each of these things, there’ll be a close to zero chance of your PC being infected in future. The backup technique I use, especially now that Samsung SSD are more affordable, for all your readers to consider. FIRST, use Leo’s recommended cleaners, update all programs, and optimize your primary SSD. NEXT, in my case, I unplug the SATA DVD burner, and plug in a new SDD. (120Gb is right size for me [@$70 Amazon]…I use a large, standard, back up internal hdd: Therefore NOTHING is saved in C:\ W10 Libraries!!). THEN Computer Management to partition/format new SDD. FINALLY using free Macrium Reflect I simply CLONE my primary SDD onto the back up SDD!!! LAST, sticky-note the date on the back up SDD, put it in the box it came in, and store it in a safe place. IF my primary SDD ever crashes, all I have to do is plug in my back up SDD!!! Side note: My wife’s laptop hdd died so I put in my back up SDD and away she went!! FORTUNATELY she saves all her IMPORTANT files on a thumb drive. Ordered my another Samsung 120Gb SDD and repeated back up technique I describe above!!! i must be pretty careful because there was nothing in the box after the scan. but i run an MBAM scan and an MSE scan 3 or 4 times a week. and i also clear my cashe and cookies and do a disk clean too almost daily after logging off everything. so that`s probably why. Thanks Leo, i`ve been with you for years and don`t regret one minute of it. “I also clear my cashe and cookies and do a disk clean too almost daily after logging off everything. so that`s probably why.” – You know, while there’s nothing wrong with doing this, there’s really not much point in doing it either. It does nothing whatsoever to prevent malware infections and isn’t the reason that your MBAM/MSE scans are coming up clean. Nor does clearing the cache speed up either your PC or browsing. In fact, it’s probably slowing things down somewhat. Windows caches stuff in order to speed up your browsing and, if you clear the cache, you prevent that from happening. Clearing cookies might prevent some tracking cookies from showing up in MBAM, but those are harmless and in a way a kind of false positive. Clearing cookie is rarely a good idea as you will be forced to log in again to all of your websites. I’m not sure that MBAM even detects cookies, does it? I could be wrong, but I thought it finds tracking cookies. It doesn’t and never has detected cookies. SUPERAntiSpyware does, but does not do well at detecting actual malware. CAUTION using AdwCleaner: Before you scan, check the Options drop-down menu and UNCHECK EVERYTHING, otherwise many important settings on your computer can be reset. Another caution: After first use, AdwCleaner creates a settings.ini file under C:\AdwCleaner. If this settings file is deleted by accident, AdwCleaner will start again with the default options and can possibly reset your computer settings. So, check Options every time before a scan. I find SpywareBlaster is a real help, stops a lot of nasty stuff getting there before hand. Also, be aware some supposedly “reputable” companies add PUPs to their offering. I’m looking at you, NVidia! In Windows 10 when you click on the Windows logo (start button) and then click on All Apps, note if there is the word NEW. This means that something new has been installed on your computer. Go down the list of Apps until you come across NEW beside an App. If you didn’t install this yourself, it very well could be a PUP or other unwanted software. If there is an uninstall, uninstall if you don’t want it then check in the Control Panel, Programs and Features to see if it is there. It very well could be even if you had chosen to uninstall. You may or may not be able to uninstall from the Control Panel. If that is the case, give CCleaner a chance to uninstall the App. Items show up in CCleaner that do not show in Programs and Features. Use the uninstall supplied by CCleaner. An example of the above was installed during Windows Update (it wasn’t there previously). It was called Microsoft Solitaire Collection. I did not ask for it, have not visited the store, but there it was in my list of apps. There was no uninstall nor did it show up in Programs and Features. CCleaner however uninstalled it. At the same time I uninstalled Xbox as I don’t have one and never will as far as I can see. Xbox was not available to uninstall in Programs and Features but CCleaner showed it and uninstalled it. Leo used to recommend Acronis TrueImage. This article explains why he switched to Macrium Reflect. Hi, This is the maximum that one could get away with nasty tool bars. But i do not know about some programs which would ask you to close your browser, and installing something, of which we do not know what it involves.It will also sidetrack you by giving some attractive dubious advertisements. Once you downloaded , it would have injected and the program icon would not be shown anywhere. By the time you search with the exe file, you may find your computer is having changed search engine, and also malicious programs that disguise as svchose.exe , ultimately connected to the computer and do the herculean task of repairing all your applications . Another vote for ‘unchecky’. Has saved my life more than a couple of times and seems infallible, despite my deliberately having done some VERY naughty downloads (immediately after a full backup of course!!) by way of a test. Adwcleaner removed RegistryCleanerKit by Uniblue and YouTube Downloader. Had to re-install both But it did delete many other programs of which I was not aware. Those are often confused as malware, as they comes bundled with some nasty PUPs, and if you don’t carefully read the misleading installation screens, you’ll get the foistware. I’d advise against using RegistryCleanerKit or, for that matter, any registry cleaner. Such apps do not improve performance and nor do they usually solve problems. They can, however, create a whole bunch of problems by deleting things that shouldn’t be deleted. In other words, the benefits are pretty much zero and are far, far outweighed by the risks. Malware Bytes AntiMalware: Once I downloaded the “Free” version you recommended, it installed it as a “trial Free” version and then gave a message later after some time (I do not how long) that my trial period expired and it did not run. I restarted, uninstalled, ran Registry Scan cleaner, then restarted and downloaded the “free” version again, but it did not work due to same message above! I even ran from an older stored image, and that also did not work as it recognized the current date, so I removed that “older” copy. So, it is not really FREE as you described it! Your comment? It’s the same download for both versions. You simply choose whether to run it in trial mode during the install – and if you select that option, it automatically reverts to free mode at the end of the trial period (unless you pony up, of course). There’s free and paid versions of MBAM: the paid version runs in real-time; the free version is simply an on-demand scanner. When you first install MBAM it, you have the option of choosing to run it in paid mode for a trial period (which is what I assume you did). At the end of that trial period, it automatically reverts to the free version. On a separate note, registry cleaners aren’t really a good idea. They really don’t serve any useful purpose, but can cause all sorts of problems. There is a truly free version, and that’s what I intended for you to use. I was glad to see *prevention* emphasized. But the purveyors of PUPs are getting very creative and I’ve inadvertently ended up with an unwanted toolbar (or worse) after an installation. That’s why I also rely on Ruiware’s WinPatrol Plus. It has many useful features and alerts me to PC changes, providing opportunity to deny unwanted programs/changes before they actually install. They have two other helpful programs, WinPrivacy and WinAnti-Ransom. These supplement whatever security suite is on board. An abundance of caution is always needed about software installations. And program updates — especially those tagged as being for security — must be done religiously. I don’t like the fact that Windows 10 updates on its schedule, not yours. In the past I’d frequently initiate Windows Update manually, select what seemed to be warranted, get the download, and let it install-reboot before continuing with my engineering work. Now it could be days between a critical update being released and when my PC gets it. Finally, I’ve used your recommended MBAM Free and CCleaner Free for years and consider both of them to be essential PC tools. THANKS for the info on AdwCleaner, as I was not familiar with it. “I don’t like the fact that Windows 10 updates on its schedule, not yours. In the past I’d frequently initiate Windows Update manually, select what seemed to be warranted, get the download, and let it install-reboot> – You can still check for updates manually and schedule the restart. Before doing any process that looks at every file on the drive, I run the free version of cCleaner (www.piriform.com) to get rid of thousands of unneeded files. Fewer files to scan=faster scan. I downloaded AdwCleaner using “Download Now @BleepingComputer” as recommended. However, before I executed it I had the file scanned by VirusTotal at https://www.virustotal.com. This resulted in findings of “Malware.Undefined!8.C-HzyytRqxDXR (Cloud)” and “Trojan.Generic ” and now I am afraid to run it. Are these true positives indicating an infected file that should be eliminated or false positives meaning I can use it, or something else entirely? It’s a false-positive, for sure. That said, I’d recommend not using AdwCleaner unless you believe that your system has been compromised. As I said above, while it’s certainly an effective removal tool, it does have the potential to cause problems. When I used to run gmail on google chrome I always ended up with 7 or 8 pups. Never hardly ever have them when I run gmail on Firefox. Needless to say I never install chrome anymore. I’ve just run Adware Cleaner. It found one problematic program, Freemake, which I don’t think is malware and was left alone. Then I ran Malwarebytes. Took MUCH longer, and found five problems, none of which were Freemake, but all of which looked unsavory and were OKed to be deleted/quarantined. My conclusion: Forget AWC, stick with MWB. I’ve twice now seen MWB find about 500 PUPs on client computers, after which they ran much faster. AdwCleaner gets some adware that Malwarebytes misses. Freemake is legit, but it comes bundled with garbage. That’s possibly why it was flagged by AdwCleaner. 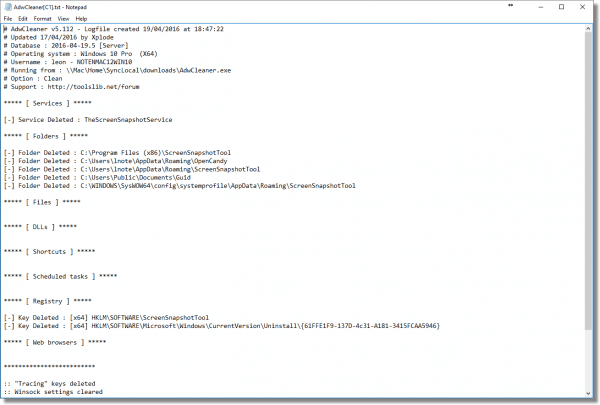 JRT (Junkware Removal Tool) catches a few things that neither MBAM nor AdwCleaner does.